DEJAVU is indisputably Australia’s most respected and applauded corporate outfit boasting 14 strong and very successful years – the event industry recommends this country’s finest! 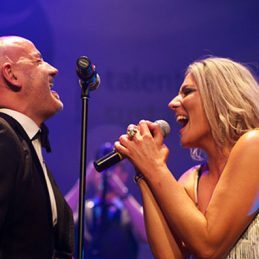 Fronted and managed by veteran Melbourne entertainer Anthony Jaye, this outfit began its journey and established itself in 1996 setting and maintaining the benchmark within the Australian corporate event industry. Whilst the envy of some and the very obvious inspiration of many others, this entourage of professionals carry an enigma of stage presence and performance energy that is truly unsurpassed in this market place. Slick, tasteful, and extraordinarily accurate in the execution of every single show performance, DEJAVU deliver an outstanding entertainment experience that is guaranteed to thrill every audience. The secret behind that delivery is very simple, An honest commitment to entertainment and a very genuine passion for live performance. The “SHOW” pays the ultimate tribute to the timeless dance floor anthems that stole the hearts of millions. Chart-busting classics from the 70’s, 80’s & 90’s from legends like Michael Jackson & the Village People to raunchy disco beats from the very original soul divas Tina Turner & Gloria Gaynor. Party tunes from the song writing legends of ABBA & theBee Gee’s, to great Aussie tributes from ACDC, Dragon and everyone’s favorite sons; John Farnham and Jimmy Barnes. More modern day super stars like Kylie, Madonna & Robbie Williams are also on the DEJAVU hit list!! DEJAVU simply says “Thank you” to those musical geniuses’ responsible for the sounds that have made the last 40 years so very memorable for all of us.